Health Tips1. Bananas are an excellent source of potassium.2. Bananas can help cure an upset stomach by stimulating the production of mucus and cells in the stomach, thus creating a barrier between the stomach lining and the acids that cause upset stomachs and heartburn.3. Bananas have been seen to be useful in the treatment of goiters, which are enlargements of the thyroid gland.4. The pectin (a soluble fiber) in bananas helps fight off colon and pancreatic cancers.5. Bananas have antibiotic properties to help fight off infections and viruses.6. 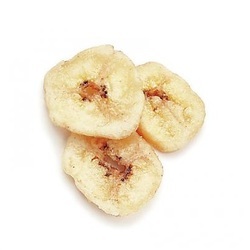 Bananas are excellent energy snacks, particularly for the after-activity period. They contain vitamins B6 and C, potassium, and dietary fiber. During strenuous physical activity, your body loses a lot of these vitamins and minerals and eating a banana will help replace them and keep you going. Runners and bikers eat bananas after races for that reason. Bananas also contain more digestible carbohydrates than other fruit, calories from which the body burns off more quickly and easily than from protein or fat.